We’d love your help. Let us know what’s wrong with this preview of My Country, 'Tis of Thee by Claire Rudolf Murphy. More than any other, one song traces America’s history of patriotism and protest. Everyone knows the words to “My Country, ’Tis of Thee.” What most don’t realize is that this iconic song has been a beacon of change for hundreds of years. Generations of protesters and civil rights pioneers have created new lyrics, beginning in royalist Britain and continuing through conflic More than any other, one song traces America’s history of patriotism and protest. To ask other readers questions about My Country, 'Tis of Thee, please sign up. It doesn’t matter how long you’ve worked as a children’s librarian. It doesn’t matter how many books for kids you’ve read or how much of your life is dedicated to bringing them to the reading public. What I love so much about my profession is the fact that I can always be surprised. Take My Country, ‘Tis of Thee by Claire Rudolf Murphy as a prime example. I admit that when I glanced at the cover I wasn’t exactly enthralled. After all, this isn’t exactly the first book to give background informat It doesn’t matter how long you’ve worked as a children’s librarian. It doesn’t matter how many books for kids you’ve read or how much of your life is dedicated to bringing them to the reading public. What I love so much about my profession is the fact that I can always be surprised. Take My Country, ‘Tis of Thee by Claire Rudolf Murphy as a prime example. I admit that when I glanced at the cover I wasn’t exactly enthralled. After all, this isn’t exactly the first book to give background information on a patriotic song or poem. We’ve seen a slate of books talking about "We Shall Overcome" over the years (one by Debby Levy and one by Stuart Stotts) as well as books on the Pledge of Allegiance or “The New Colossus”. So when I read the title of this book I admit suppressing a bit of an inward groan. Another one? Haven’t we seen enough of these? Well, no. Turns out we haven’t seen enough of them. Or, to be more precise, we haven’t seen enough good ones. What Murphy manages to do here is tie-in a seemingly familiar song to not just the history of America but to the embodiment of Civil Rights in this country itself. So expertly woven together it’ll make your eyes spin, Murphy brings us a meticulously researched, brilliant work of nonfiction elegance. Want to know how to write a picture book work of factual fascinating information for kids? Behold the blueprint right before your eyes. The press for this book says, “More than any other, one song traces America’s history of patriotism and protest.” More than you ever knew. Originally penned in 1740 as “God Save the King”, the tune was sung by supporters of King George II. It soon proved, however, to be an infinitely flexible kind of song. Bonnie Prince Charlie’s followers sang it in Scotland to new verses and it traveled to America during the French and Indian War. There the colonists began to use it in different ways. The preacher George Whitefield rewrote it to celebrate equality amongst all, the revolutionary colonists to fight the power, the loyalists to celebrate their king, and even a woman in 1795 published a protest verse for women using the song. In each instance of the song’s use, author Claire Rudolf Murphy shows the context of that use and then writes out some of the new verses. Before our eyes it’s adapted to the Northern and Southern causes during The Civil War. It aids labor activists fighting for better pay. Women, Native Americans, and African-Americans adopt it, each to their own cause until, ultimately, we end with Barack Obama as president. Backmatter includes copious Source Notes documenting each instance of the song, as well as a Bibliography and Further Resources that are split between “If You Want to Learn More” and “Musical Links”. There is also sheet music for the song and the lyrics of the four stanzas as we know them today. There’s always a bit of a thrill in being an adult reading information about history for the first time in a work for kids. I confess readily that I learned a TON from this book. But beyond that, it was the scope of the book that really captured my heart. That it equates patriotism with protest in the same breath is a wonderful move in and of itself. However, part of what I like so much about the book is that it is clear that our work is nowhere close to done. Here is how the book ends: “Now it’s your turn. Write a new verse for a cause you believe in. Help freedom ring.” Right there Murphy is making it clear that for all that the Obama’s inauguration makes for a brilliant capper to her story, it’s not the END of the story. People are still fighting for their rights. There are still causes out there worth protesting. Smart teachers, I hope, will brainstorm with their students the problems still facing equal opportunities in America today and will use this book to give kids a chance to voice their own opinions. There’s a trend in nonfiction for kids right now that you’ll usually find in science picture books. When it comes to selling books to children, it can be awfully frustrating for an author to have limit their work to a very precise age range or reading level since, inevitably, your readership ages out of your book fairly quickly. The solution? Two types of text in the same book. The author will write a simple sentence on a page and then pair that with a dense paragraph of facts on the other. The advantage of this is that now the book reads aloud well to younger ages while still carrying information for the older kids. Or, put another way, children studying a subject can now get more information out of a single book if they’re interested and can disregard that same information if they’re not. I mention this because the layout of this book looks at first like that’s what Murphy was going for. You’ll have the factual information, followed by the new verses of the song. Then, at the end, in larger type will be a simple sentence. Yet as I read the book it became clear that what Murphy’s actually doing is using the large type sentences to draw connections from one page to another. For example, on the page about women marching for the right to vote, the section ends with the large type sentence, “But the privilege to vote didn’t extend to Native Americans, male or female” (a fact that, I am ashamed to say, I did not know). Turn the page and now we’re reading about the Native American struggles for Civil Rights and after reading the factual information the bolded sentence reads, “Equality did not exist for everyone in America.” Turn the page and there’s Marion Anderson. And it is at this point that Murphy draws her most brilliant connections between the pages. Marion Anderson leads to Martin Luther King listening to her Lincoln Memorial performance on the radio when he is ten, then we turn the page to King proclaiming “My country, ‘tis of thee” in his “I have a dream” speech, which then naturally ties into Aretha Franklin singing the song at the inauguration of Barack Obama. Amazing. Now I’ve a funny relationship to the art of Bryan Collier. Sometimes I feel like he gives a book his all and comes out swinging as a result. If you’ve ever seen his work on Uptown or Knock Knock or Martin's Big Words or Dave the Potter then you know what he’s capable of. By the same token, for every Uptown there’s a Lincoln and Douglass where it just doesn’t have that good old-fashioned Collier magic. I worried that maybe My Country, ‘Tis of Thee would fall into that category, particularly after seeing the anemic George Washington awkwardly placed on the book's cover. As it turns out, that’s probably the weakest image in the book. Go into it and you’ll see that Collier is in fine fettle for the most part. For example, in a section discussing how both the North and the South adopted this song and sang their own verses to it, Collier brilliantly overlays a soldier’s tent against a plantation background. Inside the tent are shots of the battle raging, letters from the soldiers spilling out over the sides like a fabric of their own. Turn the page and now the fields are bare, the Emancipation Proclamation having been declared, and the papers you see floating across the earth and into the sky all begin with “A Proclamation”. This is the kind of attention to detail that gets completely ignored in a work of nonfiction, even when the artist has taken a great deal of care and attention. It took me about five or six reads before I would notice the photographs of kids interspersed with the drawn people. And sure there’s the occasional misstep (the tea dumped by the Bostonians looks a bit more like the wings of birds than something you'd like to consume, and while Collier nails Aretha Franklin better than anyone I’ve ever seen he just can NOT get George Washington quite right) on the whole the book hangs together as well as it does because Collier knows what he’s doing. I can already tell you that this book will not get the attention it deserves. And what it deserves is a place in every single classroom, library, and bookstore shelf in the nation. Yet this isn’t a work of children’s nonfiction that slots neatly into a pre-made hole. There’s nothing else really like this book out there. That it works as a brilliant piece of nonfiction as well as a smart as all get out piece of history and classroom ideas for teachers is clear. What it has to say about our country and our people and how they’ve fought for their rights should not, under any circumstances, be missed. It’s hard to write patriotic American fare for kids that doesn’t just sound like boosterism. This book manages to pull it off and you feel pretty good after it does. Do not miss it. Don’t. Really enjoyed the history and various versions of the song. I found the 1795 version still appropriate today. Also an older labor song seems apt. "My country, Really enjoyed the history and various versions of the song. I found the 1795 version still appropriate today. Wonderful ending with Marian Anderson's version sung on the steps of the Lincoln Memorial. Followed by Martin Luther King's version from the March on Washington and finally Aretha Franklin's version at Obama's inauguration. History of the song, beginning with its roots as "God Save the Queen." Traces new verses of the song written to advocate for various movements in history such as women's suffrage and the Civil Rights movement. End notes in book are a fascinating read of where various new verses were published. Informative, enlightening and fascinating with exceptional illustrations by Bryan Collier. To be honest the art was a slapdash mix of watercolor and collage and photography, and it was not well-done in my opinion. But the message, is important, and is well written. This is a beautiful book that explains and shares the many incarnations of the tune My Country 'Tis of Thee. It takes it from England to the American Colonies to many of our social change movements. This book follows the history of the song “America” and how the lyrics evolved over the years to reflect the political exigencies of the day. Because it is such a well known tune, and because it is such an iconic statement of about the ideals of America, generations of protestors have changed the words as part of their struggles for rights. The author explains that the song first appeared in England in the 1740s as “God Save the King.” She then takes the song across the Atlantic where the colonis This book follows the history of the song “America” and how the lyrics evolved over the years to reflect the political exigencies of the day. Because it is such a well known tune, and because it is such an iconic statement of about the ideals of America, generations of protestors have changed the words as part of their struggles for rights. The author explains that the song first appeared in England in the 1740s as “God Save the King.” She then takes the song across the Atlantic where the colonists sang it, altering the words when they declared independence. In 1831, Samuel Francis Smith published the version we sing today that begins with “My country, ’tis of thee, Sweet land of liberty, of thee I sing.” But women, blacks, Native Americans, and labor activists later issued adaptations of the song to reflect their lack of liberty. In each instance, the author explains the context and supplies some of the new verses. And this will be the day -- this will be the day when all of God's children will be able to sing with new meaning: My country 'tis of thee, sweet land of liberty, of thee I sing…." She concludes by noting that forty-five years after Martin Luther King, Jr.’s plea, the first person of color was elected to be President of the United States, and Aretha Franklin sang “America” at the inauguration. At the end of the book, the author provides source notes, a bibliography, links to further resources, and sheet music for the song as we know it today. Multiple award-winning illustrator Bryan Collier uses dramatic two-page mixtures of watercolors and collage. As always, he doesn’t just illustrate the text; his imagery adds his own commentary, enhancing the text with additional meaning. Evaluation: This is an excellent way to teach children American history from a unique perspective, in two senses: one is that it provides an encapsulation of American history from the viewpoint of minorities, and two, it uses a clever and interesting approach with its focus on the changing lyrics of one song. This is a book for readers, learners, and singers, ages 5 and up. The main character of the book is a well known song — “My Country, ‘Tis of Thee” — representing the history of civil rights as seen through sets of shifting verses. This is a nonfiction historical/instructional picture book, narrated in third person with a tilt towards second person at the very end. The events of the book unfold chronologically in a succession of quoted verses and careful explanations, covering historic decisions, struggles and battles, protests and persistence, activism and patriotism. More than just a bedtime story, this is a tale to be shared in classrooms, family rooms, libraries and more. The setting of this historical tale moves from Britain to America. This book might be read any day at any time, as an adult, as a teen, as a tween, as or to a child. The events of this book span a time period of over two centuries, dating back to the 1740s and moving through today. Readers will choose this book for many reasons — perhaps to learn more about American history, or more about civil rights, or more about the power of music, or more about social change. Why does this song carry so much weight? The reasons can be seen in the lyrics of the shifting verses chronicling social change. Readers are changed as they learn more about the growth of civil rights as seen through the shifting lyrics of a well known tune. The song of the title is changed as the lyrics are continuously revised to advance and reflect social and political change. The story ends on a note of hope and in invitation to the reader to contribute to the ongoing growth and promotion of civil rights by penning a new verse of their very own. Just change a few words and it could be Bernie Sanders' campaign song! Billionaire for Millionaire and do something different with the last line. If elegance in writing is communicating profundity clearly, then Claire Rudolf Murphy’s My Country ’Tis of Thee is quite an elegant book. Murphy recounts how the song “My Country ’Tis of Thee” has been adapted by various groups for various, sometimes opposing purposes. British loyalists and revolutionary soldiers, Union soldiers and Confederate soldiers, Abolitionists, Suffragists, civil rights activists—all have used their own versions of “My Country ’Tis of Thee.” As Murphy follows the song’s If elegance in writing is communicating profundity clearly, then Claire Rudolf Murphy’s My Country ’Tis of Thee is quite an elegant book. Murphy recounts how the song “My Country ’Tis of Thee” has been adapted by various groups for various, sometimes opposing purposes. 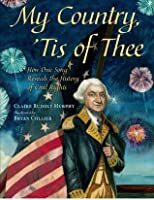 British loyalists and revolutionary soldiers, Union soldiers and Confederate soldiers, Abolitionists, Suffragists, civil rights activists—all have used their own versions of “My Country ’Tis of Thee.” As Murphy follows the song’s transformations, she paints a nuanced portrait of the United States throughout its history. The back matter includes source notes for each spread. These notes are packed with fascinating factoids and minutiae. Brian Collier’s illustrations are wonderful, utilizing collage, watercolor, photography, and other techniques and media. A wonderful book, My Country ’Tis of Thee has a place in every schoolroom and school library. I read this to my three girls, ages 8, 6, and 4. It was interesting how each of these ages absorbed different amounts of information. They were all enthralled by the poetry of the different versions of the song, and for my oldest is was a great history lesson. I got a copy several months ago, but brought it out last night because my oldest is learning the words of My County Tis Of Thee with her Girl Scout troop. I learned things about the civil rights movement from this book as well. For instance I read this to my three girls, ages 8, 6, and 4. It was interesting how each of these ages absorbed different amounts of information. They were all enthralled by the poetry of the different versions of the song, and for my oldest is was a great history lesson. I got a copy several months ago, but brought it out last night because my oldest is learning the words of My County Tis Of Thee with her Girl Scout troop. I learned things about the civil rights movement from this book as well. For instance, I did not know that the last group in America to gain the vote were Native Americans. It's very refreshing to read a nonfiction picture book that introduces little known or little covered information. Use in American Girl Program- Melody Ellison. So, I wasn't as thrilled with this book as everyone else was. I saw aspects this book as "America was a horrible place UNTIL we elected Barack Obama". In other words, the typical indoctrination of our youth that you see in some of these children's books. I think it was more some of this author's choice of words. Furthermore, I think children of the age group that this book is targeted towards will have difficulties with comprehension. ON THAT NOTE! : I loved how the author broke down lyrics to th So, I wasn't as thrilled with this book as everyone else was. I saw aspects this book as "America was a horrible place UNTIL we elected Barack Obama". In other words, the typical indoctrination of our youth that you see in some of these children's books. I think it was more some of this author's choice of words. Furthermore, I think children of the age group that this book is targeted towards will have difficulties with comprehension. ON THAT NOTE! : I loved how the author broke down lyrics to the song and applied them to what was happening in history at the time. Just a really cool and creative idea. Unless you were alive in 1831 it's probably hard to pinpoint when America, words penned by Samuel Francis Smith, was assimilated into your mind's cultural repertoire. It stands to reason it was probably first heard in an elementary school music class. For other individual groups throughout history it gave voice to their beliefs. My Country 'Tis of Thee: How One Song Reveals the History of Civil Rights (Henry Holt and Company) written by Claire Rudolf Murphy with illustrations by Bryan Collier ex Unless you were alive in 1831 it's probably hard to pinpoint when America, words penned by Samuel Francis Smith, was assimilated into your mind's cultural repertoire. It stands to reason it was probably first heard in an elementary school music class. For other individual groups throughout history it gave voice to their beliefs. My Country 'Tis of Thee: How One Song Reveals the History of Civil Rights (Henry Holt and Company) written by Claire Rudolf Murphy with illustrations by Bryan Collier explores the value of a single song; its place on the timeline of change in the United States. Land of the pilgrims' pride! 10 year old Martin Luther King, Jr. was listening on the radio to Marian Anderson this special day in 1939. Would make a good classroom study. This book is begging for a timeline and taking some side trips with other novels, books, songs & art about the whole span of American History. I love that the ending asks the reader to write their own verses. A culminating project to study of American History and it's peoples' movements would be to study a social justice issue and have students write their own verses. There's a very interesting history behind this song (which I grew up knowing as "America"). The author takes us through the story step by step, as one group of people after another adopt the tune and change the lyrics to reflect a particular cause. Very effectively illustrated by Bryan Collier. bookaday #70. Excellent nonfiction showing the history of this patriotic song and how it has been changed to suit various groups' purposes. Striking illustrations mix watercolor and photo collages. Good back matter documenting each spread's sources. Be sure to look under the dust jacket for a close up of one of the images in the book. This picture book will be a great addition to the middle school library. It's bibliography alone shows the research. It tells a wonderful story (factual story) of a song and it's variations to serve people in despair, rejoice or unity. It encourages the reader to write their own verse. Great cross curricular activity. A stunning new picture book illustrated by Bryan Collier traces the history of this iconic song, which has been sung in various versions over the years to express the longings for freedom and equality of different underrepresented groups. Told in a chronological style, the book highlights struggles by women, Native Americans, African Americans and others to achieve liberty for all. Stunning, the progression of the text and how it connects the song and various civil rights events (for freedom, women, and races), is outstanding. The illustrations are lovely with painting and some collage to give them depth. How the song God Save the King evolved through the history of civil rights becoming the well loved American song My Country 'Tis of Thee. This will appeal to history buffs and would be a useful perpective in understanding American history. A well researched and fascinating history of the evolution of the patriotic song. The writing is perfectly done for reading aloud and sharing with children. Collier's mixed media artwork blew me away. Highly recommend this book for classroom use in grades 3-5. Claire Rudolf Murphy has loved history since she was a young girl; in fact she majored in it at Santa Clara University. Murphy is the author of fourteen books for children. A former middle and high school teacher, she is a member of the faculty of Hamline University's Masters of Fine Arts in Creative Writing for Children and Young Adults. She lives in Washington.